Another history book? No, this is much more. It’s a collection of stories from the Giro and Italy that goes beyond a sepia-tinged list of past race incidents, names and nostalgia. The second-edition version is also updated with commentary on the sport that looks at how the Giro is trying to find its place in the sport. It covers history but through stories and people. Sykes has his views and isn’t afraid to share them, for example Alfredo Binda is “the greatest cyclist of all time.” There’s no debate or comparison. It’s different to John Foot’s Pedalare! Pedalare!, a more classical history book that places Italian cycling in a wider context of societal change, first growing and then shrinking in response to the rapid changes in Italy. 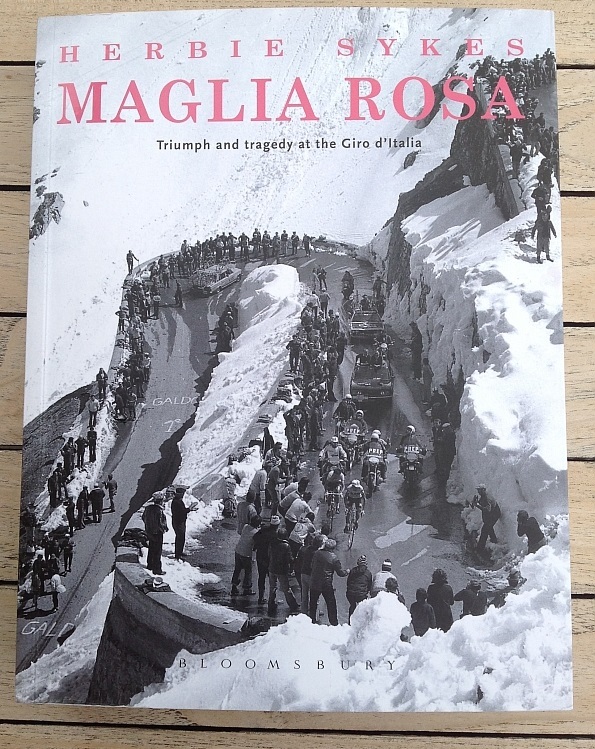 By contrast Maglia Rosa is still packed with history and context but it is telling stories about the people involved rather than the sweeping trends, the micro rather than the macro. It’s almost conversational in style, as if Sykes was reading aloud to you, for example riders “rock up” to a race and he doesn’t hold back with descriptions of others. 1977 winner Michel Pollentier is “stubby short-arsed” and “little, bald, pasty and monosyllabic” whilst inhabitants of Ivrea – hosts to the Giro today – are “invariably pallid and genetically stooped people.” Marco Pantani is a “dumb big-eared kid.” But this style helps resurrect characters from the past, bringing names and characters to life, colouring the black and white of the past. The pages are packed with factual nuggets. On one page alone we learn where the word campionissimo came from and that the label “The Eternal Second” might hang on Frenchman Raymond Poulidor but was in fact created long before for Gaetano Belloni in 1919. Elsewhere in 1936 football club Juventus might have won the Serie A title but the news was relegated to page 5 of La Gazzetta Dello Sport because the Giro was on the front page. Unthinkable today? As well as the detail, the photos stand out. 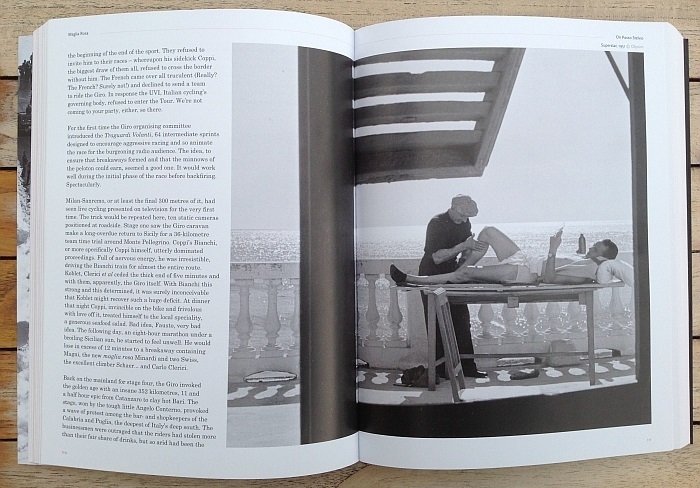 It’s published by Rouleur and you get the big pictures that you’d associate with the magazine. If fact you can leaf through the book for the photos alone. On a related point the book is heavy, printed on thick paper. The further you go through the book the more it changes from history and tales of the past into analysis and comment. This is the second edition of the book and there are extra chapters on the Giro finding its place in the sport and even the world. After receiving this book I flipped through the pages but was quickly caught by this latter analysis. The personal account of experiencing a stage of the Giro during the height of the Pantani mania is notable and the account of interviewing Leonard Piepoli (“I was left feeling like I’d spent two hours inside a Camus novel“) is interesting too. The final two chapters ask what is Italian cycling for and where is it going. I won’t spoil it but it’s interesting to see how the Italian cycling media navigate the route between nostalgia and sport, home interest and the idea of the Giro as an Italian stage for an international race. What’s not to like? Well it’s missing an index which would be great given all the stories, names and places referenced in the book, you read about them and want to return but can’t look up the page. As mentioned above Sykes’ style is biased and loud at times but that’s part of the charm. For example rather than say just say Michel Pollentier wasn’t an exciting winner he piles on the cruel terms but arguably this only makes you remember the story better. All the classic stories of the Giro are there but this isn’t a formulaic catalogue of the past that repeats old myths. There’s a lot of original research behind the writing so even if you liked Pedalare! Pedalare! you’ll enjoy this. The photos bring the past alive but so does Sykes’s style and the final chapters are amongst the most interesting because they turn analytical. The Giro might be on now but this is the kind of book you can dip in and out of to feast on Italian cycling again and again. A list of other book reviews is available here. I like Sykes; he is by far and away the better writer submitting work to Procycling, whose other articles often provide the facts but lack the heart, soul and narrative of their subject matter. Okay INRNG, I think you have “syked” me up for this treatise. 🙂 Entertaining review. Thank you. I agree with all of the above . My daughter gave me the book as a christmas present and it really is a handsome tome . I like a bit of opinion from my writers so consider that to be a plus.Just like the race itself it has a character all of its own. The original book came out almost exactly the same time as my friend Bill McGann’s “The Story of the Giro d’Italia” Volume 1. I got a copy as soon as possible and LOVED it…so much we contacted Herbie to set up a meeting – resulting in a promo where we gave copies of Maglia Rosa to clients. Herbie delivered the signed books himself – what a lovely man! Can’t wait to get my hands on this second edition, thanks for the reminder. Mmm… Hadn’t heard of this bloke, Sykes. Sounds interesting. Although he’s probably too young to have seen Pollentier live, otherwise he’d remember he was indeed an exciting rider. Perhaps Sykes is taking an Italian view of the foreigner winning their race and Pollentier could not communicate well? The Belgian does not come across at all well in the book. An “anti-hero” and comparisons with a “pedantic bus conductor” or “a school janitor” are also offered. Ah, right. Get it. I suppose Italians (as well as the French and the Spanish) were a little fed up with Belgians, and especially the Flandria team, dominating the scene in the post-Merckx years. When Pollentier won the Giro, all 3 GTs had a Belgian champion. I think no country has ever achieved that, with 3 different riders. And surely Pollentier wasn’t as elegant as Gimondi or had Saronni’s sheer good looks. And he certainly pedalled in such a crooked way that you felt tendinitis in the inner part of your knees just by watching him. But he was a much better climber and all-rounder than Moser and much more consistent than Baronchelli, and he won that Giro fair and square. He wasn’t charismatic in a direct way, but he was very noticeable as sort of a B-side to exuberant Freddy Maertens. He was really combative, too. I always liked him. If Italians underrated his victory at the time, I think it’s because Italian cycling was starting to get into a very serious crisis, when Torriani decided, without any complaint from the press and the public, that the Giro should be made for passisti veloci like Moser and Saronni to win, thus lowering the race’s prestige down to the level of the Vuelta, and all but sacrificing a generation of Italian climbers, in an era when Italian teams very seldom raced abroad. Not sure the climbers were “sacrificed” to be honest. Baronchelli, Vendi et all simply weren’t good enough – which is why they kept losing the Giro – and Battaglin could barely get out of bed at the time. So the giri of the tunnels (and time bonuses) were just expedient. Saronni and Moser sold newspapers whilst the likes of Pollentier, decent rider or otherwise, simply didn’t. Bear in mind that after five years of Merckx,Torriani couldn’t have cared less for abstracts like prestige. His federation, his employers and his public wanted Italian winners, and that’s what he set out to deliver. omg… the author himself. 🙂 Enchanté. The thing is that we will never really know how far the 80’s Italian climbers could have gotten. Contini surely had a Giro in his legs, more than Moser, if the Giri hadn’t been so flat, TT-heavy, or full of time bonuses. Beccia was also very good and could have won. Panizza would have become a leader instead of a mountain domestique for Moser and Saronni. And foreign climbers who went to Italian teams (Van Impe, Lejarreta) wouldn’t have wasted some valuable time and energy competing for Giros they could hardly have won. The following Italian generation (Chioccioli, Giupponi, Giovannetti) had a harder time progressing than it should have had, and Italians became so not used to demanding GTs that they didn’t perform half-decently in the TdF for almost 15 years. And, exactly, Torriani wasn’t looking beyond Italy and the short term. And in the era were GTs were beginning to be internationally broadcast, it was probably a mistake, that squandered not only a good deal of the Giro’s historic prestige, but also of its market value. Things got better from 1987 on. In a sense, Roche did the Giro a bit of a favour in Sappada. Thing is that when Pollentier and De Muynck won the Italian press slaughtered Torriani, all of them. The three summit finishes in ’78 were a disgrace, the Giro disfigured, Moser “handicapped” (to quote Bicisport) by Torriani’s intransigence. Italians wanted to see their great champion thump Didi Thurau, and that was that. So Torriani was damned if he did and damned if he didn’t. He tried to design balanced routes, but none of that generation of climbers were good enough and so they crucified him for it. As regards short-termism, Rizzoli was very close to going bust, and the Giro was losing money. Moser and Saronni (and to a degree Hinault) probably saved it from going under. Even Castellano admits that. Another thumbs up for the book in particular and for Herbie Syke’s writing style in general – I’m a big fan of the colour with which he splashes throughout his writing.